Have you ever heard the phrase “kill two birds with one stone?” If so, you are not alone. The growing number of dual- and triple-branded hotels opening up across the U.S. suggests that many hospitality owners, developers and brands are expertly applying this logic to the lodging industry. Dual- and triple-branded hotels, jointly referred to as multi-branded hotels, combine two or more hospitality brands within the same development. Utilization of the multi-brand strategy has steadily grown in popularity in the U.S. over the past decade. So where did this trend come from, what are some of the pros and cons of this asset type, and how can you as an owner, operator, investor, or developer evaluate if the multi-branded option is the right fit for your next project? Keep reading to find out. Multi-branded hotels are not a new concept. In fact, one of the first dual-branded hotels in the world debuted in France in 1984. This hotel, the ibis/ Novotel Paris La Défense, was developed by the AccorHotels group and is still in operation today (Perreten & Perret, 2016). Over two decades later, White Lodging, a Chicago-based hotel ownership and development firm, pioneered the dual-branded concept in the U.S. in 2005 (Sturken, 2018). Since this initial debut, White Lodging has added seven additional dual-branded hotels to its portfolio and, as of 2017, had three more in the pipeline (Sperance, 2017). Similar shifts toward multi-branded options have been seen across the industry. In 2013, it was reported that the “Marriott expects that 12 percent of all Residence Inn new construction will be combined with other related Marriott brands” and that “Hilton [had] 15 dual-branded hotels in North America, with 15 more coming up in the next few years (Rang, 2013).” Moreover, a recent report by Lodging Econometrics states that as of December 2018 there were “244 [lodging] properties under development on 192 shared sites. That includes both dual- and triple-branded deals. And, in the next 12 months, another 414 hotels on 281 shared sites are expected to break ground (Sturken, 2018).” These statistics demonstrate a growing embrace of the multi-branded hotel strategy that is expected to continue into the foreseeable future. There are a number of factors behind the emergence of multi-branding as a competitive lodging development strategy. In many ways, the growing popularity of this approach can be seen as a response to rising development costs (Carr, 2016). Viable land for hotel development is becoming an increasingly scarce commodity, especially in top-tier urban markets. Moreover, construction costs have been on an upward climb for the past decade. This dynamic incentivizes developers to find innovative ways to enhance project profitability and find better ways to capitalize on their investment. By combining multiple brands within a single project, developers can use a single asset to attract unique target markets. This diversifies the customer base for the asset, which can have a positive impact on hotel occupancy. Multi-branding can also result in significant operational efficiencies that reduce operating cost and boost hotel profits. While there is no denying its tremendous upside potential, the multi-branded hotel strategy is not without its share of challenges. One of the biggest challenges faced is ensuring that the unique brand experience of each hotel component is not diluted (Hughes, 2018). Though consumers have been largely receptive to the multi-branded concept, most still desire the distinct brand experience they have come to know and expect from a brand during their past patronage. Operators such as Hilton have even developed strict separation guidelines to combat the risk of diminished brand experience (Carr, 2016). Brands within multi-branded hotels must also combat the risk of eroding brand loyalty through the promotion of dual- and triple-brand offerings. Moreover, hotel operating groups such as Hilton are becoming more sensitive about allowing multi-brand concepts involving brands from competing operators. Though multi-branded hotel developments share a lot in common with traditional hotels, there are several unique factors to consider when exploring the multi-branded hotel option. 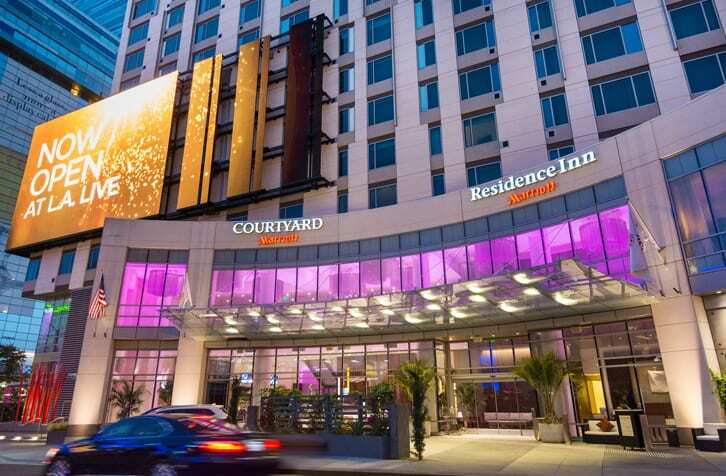 For starters, investors must determine if a multi-branded hotel is sustainable for the market. This means that, in addition to performing a highest and best use analysis, investors must also conduct a build-up analysis. As J. Carter Allen of HVS outlines, “a build‐up analysis should be performed to identify the primary market area. This analysis essentially quantifies the existing demand in a market by estimating occupancy and market segmentation for each hotel in the competitive set and results in a forecast of occupancy for each brand (Allen, 2018).” According to Mr. Allen, dual-brand hotels typically work best in urban centers and mixed-used developments where land is scarce. 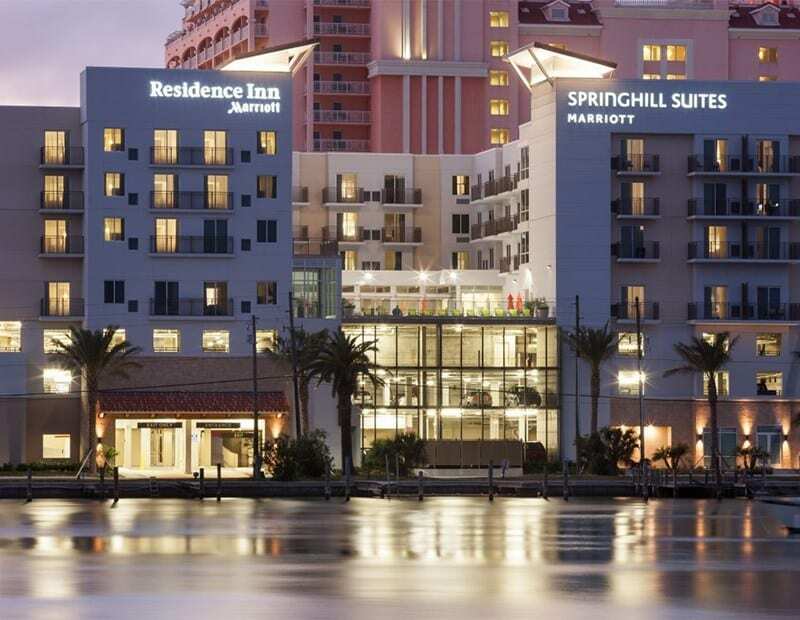 As an example of how the table above works, the common dual-branding of Marriott brands Springhill Suites and Residence Inn is an example of the “length of stay” differentiator at work. Springhill Suites provides the focused service for consumers that need spacious, suite style accommodations while Residence Inn appeals to extended stay lodgers that will be drawn to amenities like a full, in-suite kitchen. After brands have been selected, the owner must determine the best strategy for marrying these brands within the development. As noted above, some operating groups such as Hilton stipulate a stark separation between brands. In such cases, each brand may have distinct entrances, separate lobbies, and unique amenities. They may still share back of house operations and administrative staff. Other multi-branded hotels take a more blended approach where marketing, entrances, common space, and amenities are shared between the two brands. The Aloft and Element Austin Downtown in Austin, TX is a perfect example of this blended approach. The pictures below show shared entrances, signage and common space. The emergence of multi-branded hotels has been a significant, positive shift in the lodging industry. In the right context, these assets can position hoteliers to achieve greater returns on investment than a traditional hotel. With such an incentive, there is no doubt that multi-branded hotel developments will continue to grow in the years to come. Perreten, N., & Perret, S. (2016). A Dual to the Death or a Dual in the Crown: Current Trends in Hotel Branding. London: HVS.